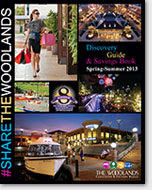 Are you looking for exciting places to visit in Montgomery County / The Woodlands area? Click on the following link to receive your free savings book! Click here for information to receive your savings book! Time: 8 p.m. / Gates: 6:30 p.m.